Friday is the day I’ve dedicated for grocery shopping. As soon as I leave work I scoot over to Food Basics. In order to get a cart I have to put a quarter in. Sometimes all goes smoothly. How hard can it be to put a quarter in and pull the cart out anyway? Well, sometimes this process is frustrating. I put the quarter in and it jams and won’t go in. So I try another cart. Or I put it in and it’s fine, but I can’t pull the chain out because it’s stuck. Or sometimes I put the quarter in, pull the chain out but the cart won’t budge. Argghhh. All I want is a cart damn it! Some days I don’t mind grocery shopping at all. On those days, I enjoy taking my time looking at ingredients outside of my grocery list. I imagine that I’m an awesome cook who loves being in the kitchen. I get giddy at the possibilities of creating all these different, wonderful meals. Ooh, what’s that? Lamb chops. I can make lamb chops. What about this kale thing? I can make some kind of dish with this. But aside from it being a vegetable, I’m not even sure what kind it is or what it tastes like. 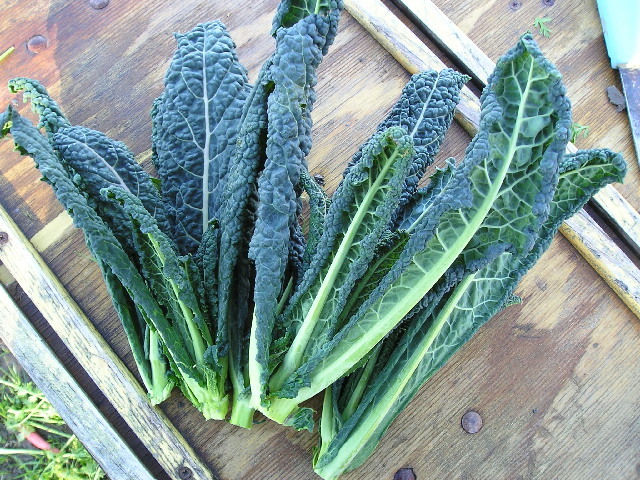 I keep seeing people’s posts and pictures of ‘kale this’, ‘kale that’. What the heck is it though? I mean, look at this thing. Okay forget it, there’s no way I can make kale. Hmm…maybe I’ll try this tempura batter. Hubby would love that! I can go on and on, mouth salivating every time I think of a crazy meal I “think” I can make. That’s the thing about grocery shopping after work. I’m usually starving and thinking about food. Then I snap out of it and realize that I’m no domestic diva. So I end up looking at frozen food options instead because I’m still so damn hungry. Maybe I’ll get this huge bag of chicken fries. And sausage rolls. Ooh ooh and dim sum! I go around picking up food, planning when we’re going to eat all this. We can make sausage rolls for snacks tomorrow (Saturday) and I’ll leave the chicken fries for Sunday dinner. My mouth is salivating and my stomach is screaming at me to feed it. Oh, but who am I kidding? I live in a 700 sq. ft. condo with a condo-size fridge and even smaller freezer. Where am I going to store all of these? Plus, we’re supposed to be eating healthy. So I go around and put every thing back, trying not to be too disappointed. Finally, when the items in my cart look more realistic, I proceed to the check out counter. This is the part I hate the most. Checking out. No no, it has nothing to do with the fact that I have to pay for all of these items. That’s the least of my worries. What do I dread the most? Bagging groceries! What happened to the days when the cashier also did the bagging? Or the days when they had separate grocery baggers? First, I put all my stuff on the conveyor belt (is that what it’s called?) as the person behind me in line is impatiently inching her way towards me, bumping my cart with her cart. I look back and give her a cut-eye. Then she backs away. When my cart is empty, I push my cart forward so I can now go behind my cart. Because there’s not enough room for me to go beside my cart, which I think would make more sense. The cashier starts scanning my items and putting them on the other side of her, on another conveyor type belt. I push my cart further out so I can start bagging my stuff as she continues to scan. But I’m not fast enough. 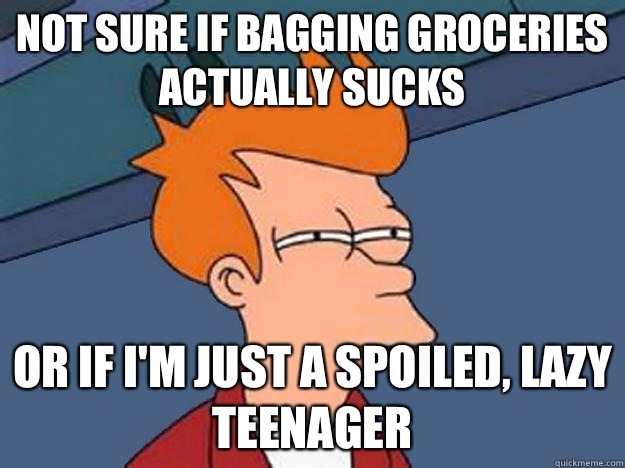 I’m not good at bagging groceries. I can type fast, I can write, I can create posters, I can use photoshop. But I can’t bag groceries. The cashier finishes scanning before I can even get half of the items in my recycable bags. So I stop bagging, dig into my purse for my wallet and give her some cash. I start bagging again and the cashier has moved on to the lady in line behind me. She’s going fast and omygod talk about pressure. If I’m really unlucky, the lady behind me only has a few items so she’s done paying before I’m done bagging. This time, she pushes me with her cart. I look over apologetically (no cut-eye this time) and frantically start to stuff every thing in my bags. Who cares if I don’t do it right, if they’re not neatly placed in the bags to maximize the space? I have to get out of this lady’s way before she bruises me with her cart. She’s not patient so she squeezes between me and the bar dividing our lane from the next. If she’s thin and can get through easily, no problem with me. But hey man, if you squeeze through and you end up squashing me against the belt, well now, I won’t be very happy and you’re damn right I’ll give you another cut-eye! Do I hate bagging because I’m just lazy like what this picture depicts? No, not at all. It has nothing to do with being lazy (or being a teenager because I’m not one, I’m a grown adult) and has every thing to do with the entire anxiety-causing process. Who knew bagging groceries could be so stressful. Those grocery baggers back in the day deserved good compensation. Definitely not an easy job. Finally I finish bagging and load them into the cart. By this point, I’m overly stressed out but relieved that I’m finally getting out of here. I put my groceries in the trunk and put away the cart because you know, I want my quarter back. For next time. But is putting the cart back as easy as it theoretically is? I mean, all I have to do is push the cart into the cart in front, stick the chain thing into the coin thing, and voila, my quarter comes out. But no, some days this is not the case. Either I try to push my cart in and it won’t go in, or I push it in but the chain thing refuses to go into the coin thing (I know I say “thing” alot but I really don’t know what they’re called). Or I push the cart in, the chain goes in but the quarter is stuck. Waaahhh. I just want my quarter back! So there you have it. Now you know why I dread grocery-shopping-Fridays. Trust me, you’ll end up buying the entire store if you ever go grocery shopping on an empty stomach. Everything looks good and you can’t wait to get home so you can eat, eat and eat. I’ve done that many times. And every time I do, I get home and I kick myself because there’s a huge cloud of regret looming over my me. And there’s the storage issue. When you have a condo sized fridge and a condo sized pantry, you’re kind of limited with space. Not to mention that we don’t need all that junk food! So…what happened last Friday? I went grocery shopping on an empty stomach. Yup. 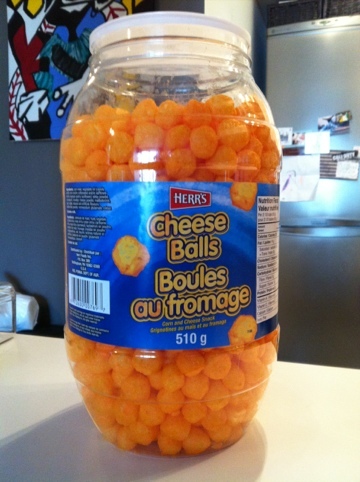 I ended up with a BIG jar of cheese balls. Oh how I love cheesy stuff. But the truth is I actually bought it for work. For my coworkers. Really I did. I’m bribing them to like me. Sad. I know. The thing though, this big jar of cheese balls is currently sitting on our dining table since it’s the weekend and so it will sit there until Monday morning. Now, if you’ve ever had a big jar of cheese balls sitting on your table or counter, you know how hard it is to pretend that it’s not there. So I cracked it open thinking I’m just going to have one. Just one. But that one turned into two and that two turned into four and well…now I’m in trouble. So let’s hope there’ll be some left for me bring to work on Monday or I’ll have nothing to bribe my coworkers with. Trust me, they love junk food and well, happy coworkers make a happy team.